"One Nation Indivisible" - Chapter Three: "Running On Empty"
Anti-superhero sentiment and war are now the order of the day on New Earth 2. Batman takes on Nimbus Solutions, who are using cancer causing materials in the power cells they sell on the black market. The conflict between Ark Home and Erebus continues to escalate. Green Lantern and other Wonders, as the metahumans are called, must find a solution to the lack of energy resources on the planet, and Val-Zod has given up his role as Superman. It looks like Earth 2's mightiest beings may have bitten off more than they could chew when the colonized this world created by Brainiac's convergence. Hawkgirl is unsuccessful in escaping the Amazons to warn the rest of the world of their plans to conquer New Earth 2. She discovers that Fury's femme fatales are not alone. They are allied with the Atlanteans, and they won't permit Hawkgirl to leave. The winged warrior woman could be in grave danger before this adventure is finished. 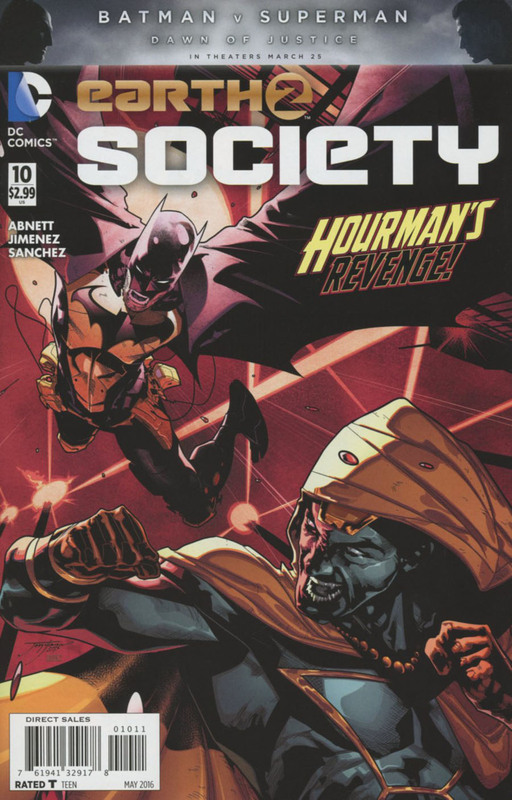 Hourman, under the control of Kyle Nimbus, is fighting Batman. The Dark Knight is losing as both Nimbus, who is a Wonder, and Hourman beat and stab him with his own Batarang. The Caped Crusader is calling Red Arrow and Wildcat for back-up, but he gets no response. With Batman and Hawkgirl in trouble, Val-Zod no longer taking on the mantle of Superman, and the rest of the superhero community trying to stop a war and provide power for their new home, what will become of New Earth 2? This and other questions will be answered next month, Superfans. Story - 5: Where the devil was Dan Abnett when this series started? He could have certainly cleaned up the mess made by his predecessor a lot sooner. I love what he's done with this story arc. He's mixed the best of superhero comic with some influence of television shows like Babylon 5. Maybe that's just the sci-fi nerdy birdy in me, but Abnett seems to have accomplished this mixture while giving readers a fun comic book to peruse. I sincerely am impatient for the next issue. Art - 4: Jorge Jimenez still did wonderful images in this issue. However, some panel look drawn in a hurry as if Jimenez was trying hard to make his deadline. In spite of this, he's still among the best working for DC Comics at the present time. Cover Art - 4: This would be a perfect cover if areas of it didn't look so rushed like the interior art. Still, it made me curious about the comic's contents, which is what every cover should do for me.